And unlike cash, bank loans, and traditional leasing, Shield provides added flexibility and protection. This payment option considers business, financial, and technology requirements associated with acquiring this type of equipment. 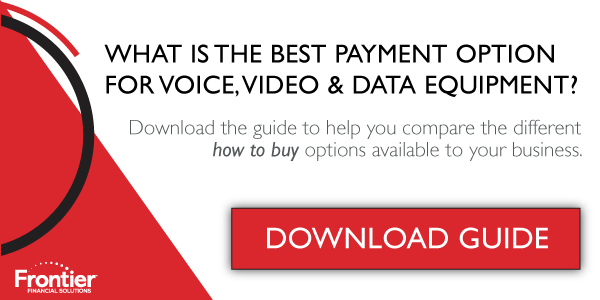 It simply is the smartest way to pay for organizations technology and communications equipment. If the current solution no longer meets a customer's needs, they can have it replaced with a new solution at any time. The existing contract is forgiven without rolling over the previous balance or charging hidden fees. It essentially works as a do-over button if the technology no longer serves the customers needs. In the event of a natural disaster, under Shield, Frontier Financial Solutions will cover your out of pocket insurance deductible on the damaged equipment. Maintenance support can easily be bundled into your rental payment to ensure that your solution is always up and running. Shield is specifically designed as an operating expense (OPEX) and qualifies for off-balance sheet accounting treatment. In addition to preserving cash and maintaining any lines of credit, this also allows customers to protect debt ratios for future use on acquisitions or activities that are more revenue generating than depreciating technology. At the end of the Shield agreement there are many different options. Frontier Communications partnered with TAMCO to design Frontier Financial Solutions (FFS). Branded financing solutions for all Frontier Communications CPE sales. While FFS provides traditional capital expense (CAPEX) lease options, the greatest value lies in Frontier Shield. Shield is technology equipment as a service. It is a monthly payment option for your technology solution that works like a termed rental, found nowhere else on the market. Shield meets technology needs today, saves capital for something unanticipated tomorrow, and has greater flexibility and control than loans, bank lines, traditional leases, or cash purchases. [fa icon="home"] 28100 US Highway 19 N.